The Business Philosophy of Thai Petroleum & Trading Co., Ltd. is simply come from its late founder Mr.Kachorn Tingthanathikul, which is "the Benefit of the Nation is More Important Than Anything". During his long working period in lube industry,Mr.Kachorn has contributed immensely to benefit of Thailand, its social and public benefit for all his life. As the Vice-President of Fund Raising Committee of Thai Red Cross during life period of 1977-1981 and was awarded the Thai Red Cross Medal (First Class) for his outstanding contribution to the society. As one of the founders of the American Chamber of Commerce in Thailand and was appointed Chairman of the membership committee. As one of the founders of Thai-Chinese friendship Association and Chairman of Ting Clan Association. As an honorary Chairman of the Hakka Association of Thailand. Awarded for the commander (Third Class) of the most Noble Order of the Crown of Thailand in 1978. Appointed to be an Honorary Chairman of the Chinese Poet's Association in recognition of the knowledge and study of Chinese culture and literature. Mr. Kachorn Tingthanatikul believed that education plays an important roll in personal improvement, which is significant power to develop the country's economy. He also showed concern about youth and fellow Thai people. Therefore, Thai Petroleum and Trading Co., Ltd. has donated funds and scholarships to various educational institutes including foundations and organizations that benefit the society at large. He also founded the Tingthanathikul foundation to further benefit the general public. Mr.Kachorn Tingthanathikul (John K.C.Ting) who livedhis life in the honorable lifestyle, which is stillremained until the present and become thecornerstone for employees. The vulnerable precedent is committed to the Honesty, Hard-Work and Work-Smart. Mr. Kachon Tingthanathikul, founder and guiding light of TP&T, has brought TP&T prospective and success today. 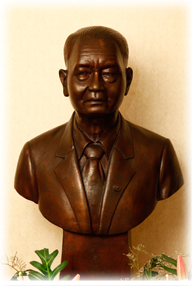 Through his life, he made contributions to the Thai-Chinese society. He passed away on February 19th, 1997, aged 88 years. His generousity has been recognized in the Thai History forever.